NRIs or Non-Resident Indians, in the recent years, have been making a great contribution to the GDP by making direct investments in the Indian financial instruments and thus this article is dedicated to them who are residing away from the land but interested in making productive investments in India. Past few decades have seen the growing interest of NRIs in Indian funds and the government has also relaxed various regulation and rules which were earlier there on NRI investments to boost the growth of the economy and its residents and Non Residents as well. Moreover, the fall in the Indian currency for last four years has made it more justifiable for the NRIs to invest in Indian funds as the return they would get increases as the currency falls. Though it is not good for the economy as a whole but the NRIs and their family, it is an opportunity to reap money on money as if the NRI is sending an amount to his or her family residing in India, the family gets more money in Indian currency than it would have got 4 years back. Before investing money in India, analyze your purpose of Investment as it would help you understand where to spend the money. Investments are mostly made for financial security in the future, and thus you need to decide whether you want to invest in Indian funds for future financial security or not. Whether you want to invest in Indian financial market for building a corpus for your retirement and life after retirement. Whether the Indian financial market would deliver the best possible returns on your investment or not. To fulfill your responsibilities at home by sending them money back and invest on their behalf in Indian funds and providing the benefits of those investments to them. If you are preparing to move back to India after a period in the foreign land, you might invest to develop financial assets in your homeland for a better future. Once you have decided the reason for your investment, then you can seek different opportunities in the market, and there are many of them. 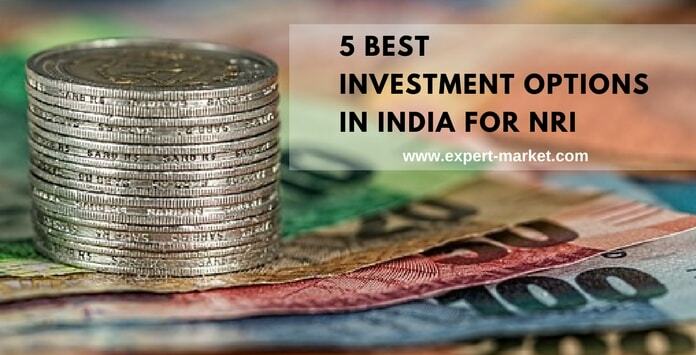 In this article, we have come up with five best possible investment options and opportunities for NRI in the current economic scenario. 1. Fixed Deposits in Bank: Though it sounds so ordinary it is the most popular form of investment done by the NRIs in India, and currently with the banks providing a real interest rate on the finances and flexible terms and conditions, it is regarded as one of the best options for investment. NRIs can open their fixed deposit accounts in any authorized Indian banks which deal in forex. Non-Resident External Accounts or NRE: This account can be maintained in Indian currency, and you can open an account like savings or current or even the recurring accounts if not only fixed deposit account with the bank. The NRE account is a mandatory one for them who are looking to invest or save in Indian banks from foreign lands, and the interest rate you can get on your savings will be within the range of 7% to 9%. The good news you don’t have to pay any tax on your savings and not even on the interest amount you receive. Non Resident Ordinary Accounts or NRO: This account can be used for receiving any income from India like rent earned on home or land, pension, It is a taxable account, and the repatriation of the account is limited as well, unlike NRE which can be quickly repatriated. Foreign Currency Non-Resident or FCNR: If you being an NRI want to avoid the fluctuations in the currency of two different nations then you can save or invest in FCNR accounts in foreign currency only. This account is also repatriated quickly, and interest earned on it is entirely free of taxes. 2. Direct Equity: NRI can invest in the shares of Indian companies not exceeding 10% of the paid capital of the company by registering a Demat account under SEBI under the PINS or Portfolio Investment Scheme of Reserve Bank of India. Firstly, you need to open a bank account – NRE account or NRO account. Then open a Trading account with the registered broker under SEBI. Open a Demat Account to purchase and sell shares. You can open only one Pin and you being an NRI can only trade in the shares of the companies which are published by RBI for trading for NRIs. Moreover, you are not allowed to short sell shares in India as well as you cannot trade on an intraday platform. You have to take the ownership of the shares before you can sell it. Looking at the current share market scenario in India, It is a perfect time to invest as the markets are in Bull Run through the volatility is enormous as well, so you need look before you leap. 3. Mutual Funds: Any of the bank accounts mentioned above will do for buying mutual funds in India for the NRIs. The investment in the mutual funds has to be done in Indian currency only, and it cannot be done in any exchange. The NRI can directly debit the amount he or she wants to invest from his or her NRE or NRO accounts to the mutual fund investment account, but the amount should come in the form of Rupee denominated check or draft only. The amount when redeemed will be transferred directly to the accounts of the investor that is you in Indian currency. You might get a check as well if you opt for. But you need to know whether the country you are residing in allows you to invest in Indian mutual funds or not as few countries don’t approve. Mutual fund investments are for those investors who want to earn more than the regular bank interest rate and have the potential to take the risk but cannot manage enough time to dedicate to invest directly in the shares or other financial instruments. The top mutual funds of India at presents earn a yearly return of 25%-28%. 4. Real Estate: Real estate investments are one of the best alternative investments you can do, and at the moment due to the massive development of the infrastructure and the housing in Indian cities, the rate is going up every day. Investing in Real estate is nothing new to the NRIs, and they have always invested into the new projects, and there are even several projects in the metro cities which are entirely owned by the NRIs. The real estate investment is not only financially security, and the value appreciates with time, but for an NRI, it is also an emotional connect with his or her roots and provides emotional safety as well. You can invest both in commercial as well as residential properties. You can buy any properties you want to, and there is no restriction as such, but the selling of those properties invites some limitations from FEMA which is the Foreign Exchange Management Act in case you are getting into any repatriation agreement or transaction. You would need a legal professional to deal with the matter during the sale of properties.